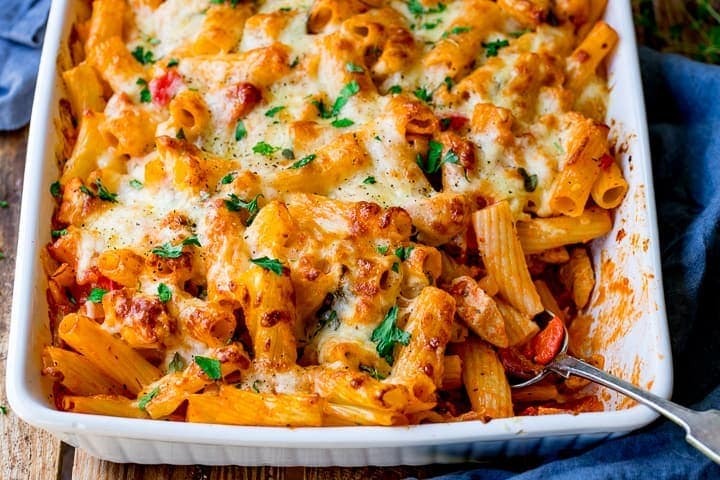 Cheesy Pasta Bake With Chicken And Bacon – a family favourite (and it makes great leftovers too!). 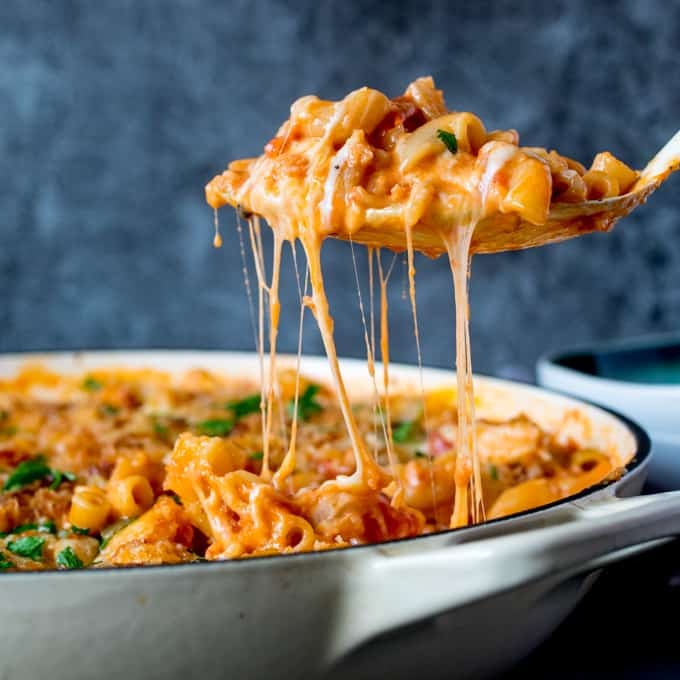 Cheesy Pasta Bake With Chicken And Bacon is one of those dinners that the kids can polish off in no time – regardless of how many veggies I sneak in there. Peppers, onions, tomatoes, spinach – it all gets thrown in. Sometimes I’ll add courgette or kale. 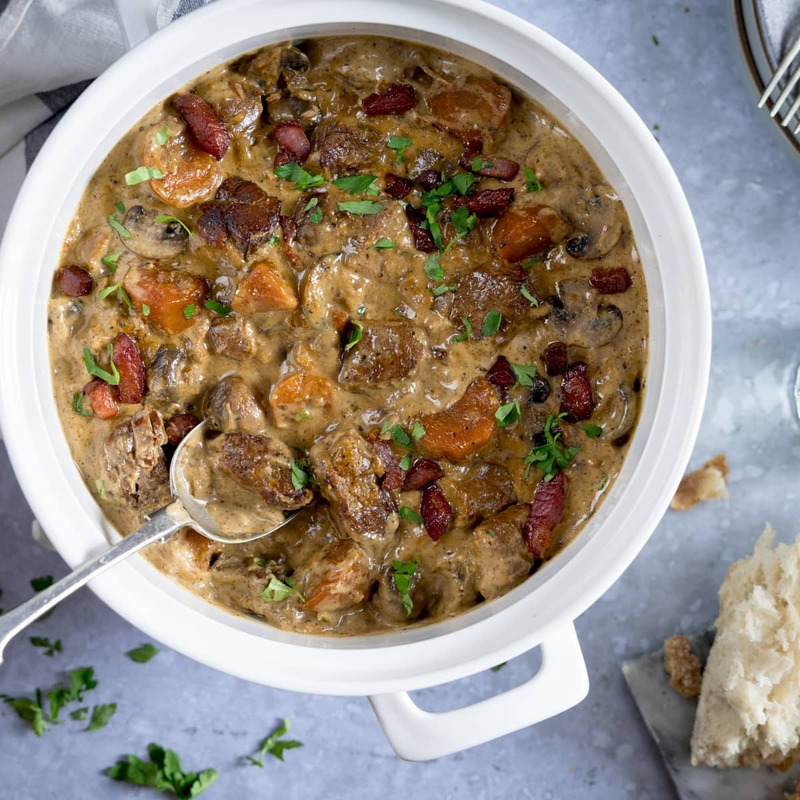 If I’m being extra sneaky I might add some finely chopped mushroom too (I’m the only mushroom lover in our house – but they all eat mushrooms if they can’t identify them hee hee hee!). I like it cold for lunch the next day too – although you can heat it up in the microwave with a tablespoon of water – to stop it drying out. 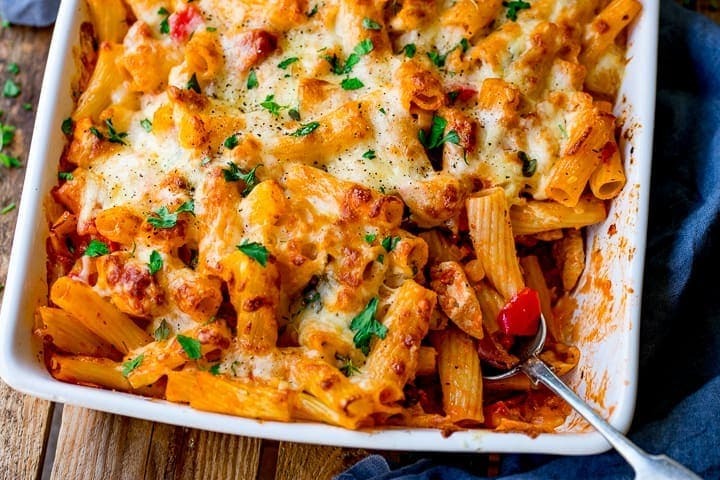 I sometimes wonder if I could eat pasta every day of the week and not get bored of it. 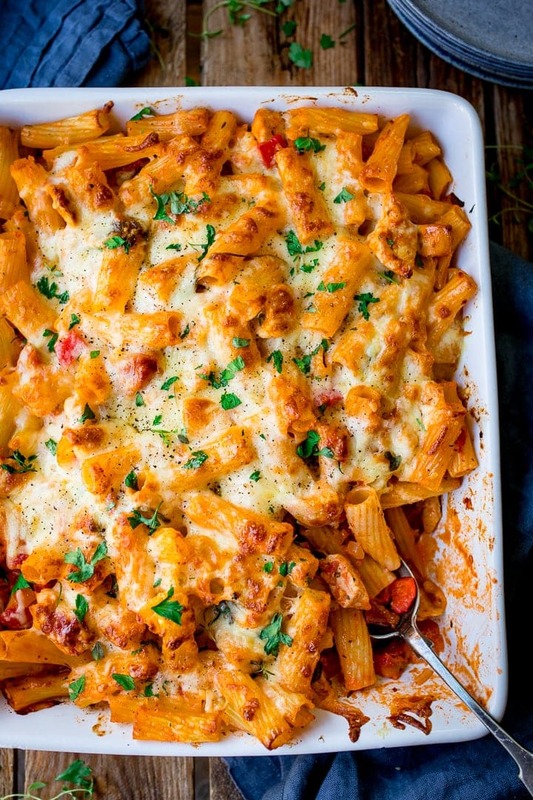 Monday: I’ll kick-off with the chicken and bacon pasta bake. Oh yeah, that was easy – I didn’t even start on the pulled pork ragu or the or the penne arrabiata!! Baking Dish. We use this glass Pirex one but you can use another oven proof dish that will hold the pasta bake ingredients. 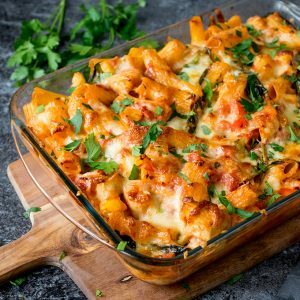 Cheesy Pasta Bake With Chicken And Bacon - a family favourite (and it makes great leftovers too!). Preheat the oven to 190c/375f. Boil a large pan of water and cook the pasta for 1 minute less than recommended on the pack. Drain. Whilst the pasta is cooking, heat the oil on a medium heat, in a large frying pan. Add the chicken, and cook until just sealed - about 5 minutes. Add the onion and cook for a further 3-4 minutes until the onion is softened. Add the chopped peppers, salt, pepper, garlic, tomato puree, oregano and thyme. Stir and cook for 2-3 minutes. Stir in the tinned tomatoes and cream, bring to a gentle bubble, then add the pasta, spinach and cooked bacon. Stir everything together, then transfer to a large baking dish. Top with the cheddar and mozzarella, and place in the oven for 20-25 minutes, until the cheese is golden brown. Take out of the oven and top with parsley before serving. 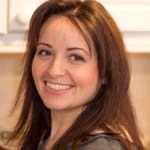 If you’ve tried my pasta bake recipe then please rate the recipe and let me know how you got on in the comments below, I love hearing your thoughts and add-ons to my recipes! Amazing! My 18month old ate every last bite. Will be adding to the family favourites. Tried this recipe for the first time today we had some roast chicken left overs…..amazing . 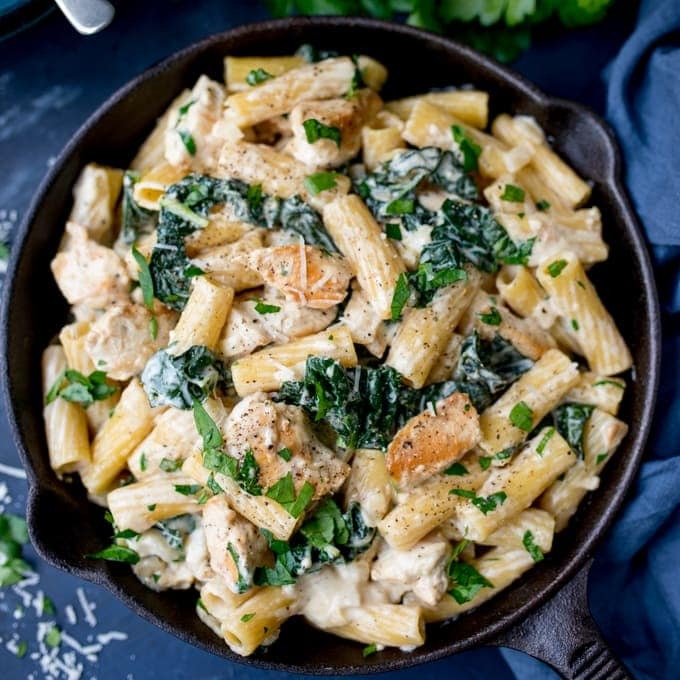 Found this recipe last night chicken and bacon pasta bake Jan 2019 made it this evening 7th Jan absolutely beautiful, my family loved it, definitely cook regular from now on and so easy to do. I think you should add a little honey or brown sugar in recipe to counteract acid in tinned tomatoes. Other than that it’s a lovely recipe and easy to do. Just wondering when you say to add some liquid when reheating what liquid would be best and how much roughly? 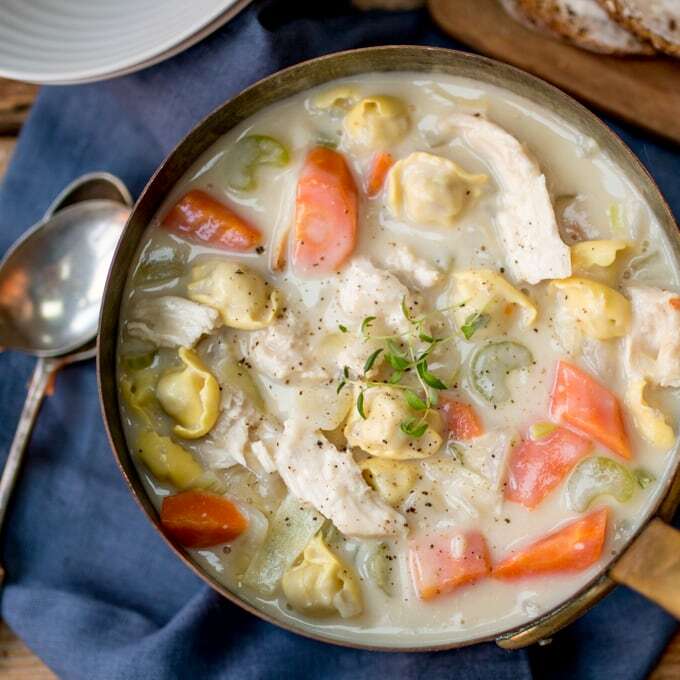 I’d add just a tablespoon of two of water or stock – just to loosen it up a little. Added lots more garlic, more tomato puree, more bacon and pepper sauce. It turned iut great.